Flying to install can have it’s challenges. We live in the age where traveling has dedicated planning to ensure a successful arrival. 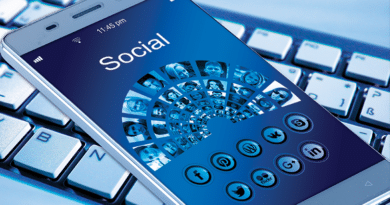 From changing TSA restrictions to layovers and missed connections, traveling has become one of the largest forms of stress within the trade show industry today. 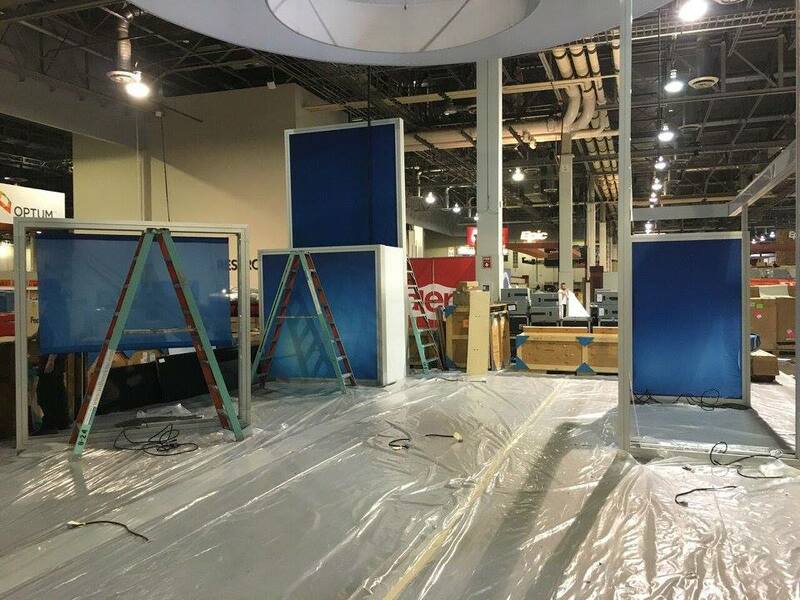 PRO Expo recently sent our team to Las Vegas for a two week trip that included three exhibit installs and an appearance at ExhibitorLive! None of which would have been possible without careful coordination from air to ground. One overlooked aspect with event traveling is the trade show install. Traveling across the country to install an expensive exhibit poses its own unique challenges- all of them starting from the first flight. 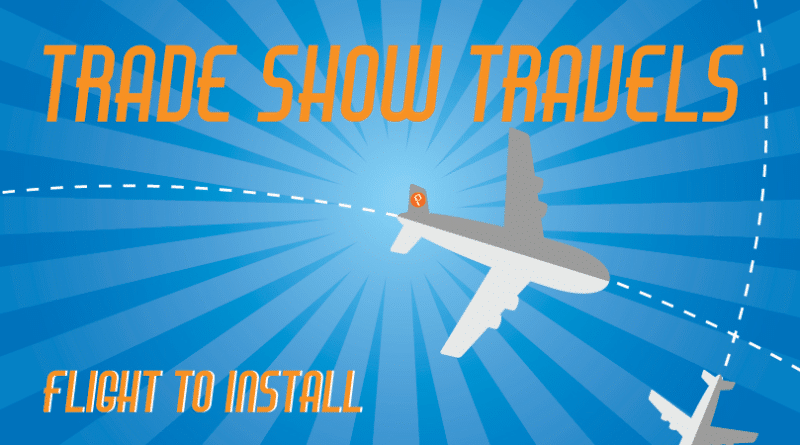 Whether you’re a traveling newbie or frequent flyer, simplifying your travels will lead to a better trade show install. Any travel starts with packing. Our exhibit manager Vance has a simple sentence to live by; “Travel Light, It’s the Only Way to fly!” Carrying unnecessary luggage and equipment on the flight delays the experience from drop off to pick-up. This can greatly increase total travel cost. Trade show industry workers may need to haul unique items to ensure a successful install such as tool kits, blades, or power tools. Unfortunately, despite our industry we are still restricted by the same TSA restrictions like anyone else. If you are traveling for exhibit install purposes, be sure to include any restricted items with your B.O.L. of your accompanying trade show freight. Small items that are non-essential to the booth could also be purchased on location if necessary. Regardless of purpose, it’s critical you keep important documents such as manuals or registration forms both on your person and within the cloud to avoid loss. Be sure to have your destination memorized and schedule of when you need to be where- flights can easily distract you from clear thinking upon arrival. Also don’t forget quality headphones and healthy snacks to keep you content while airborne. Trade show installs can be beautiful madness. Upon arrival, the focus should be checking into your hotel. Focus on yourself before putting your mind to work on the exhibit floor. Vance also notes any negative attitude should be left at the door. Delayed flight, crying babies, or wrong room? Unfortunately none of those matters during the short time you are allowed to install an exhibit. Your booth may require careful collaboration with local contractors and tough union regulations. Entering the mix with a poor mindset will only hinder the communication and performance efforts from everyone. Likewise, a rotten egg can also hinder your work on the show floor. If someone on your team is unwilling to hold your brand’s standards, feel free to have someone else carry on their tasks or replace them if possible. Worst case scenario is making the best out of your team and alter the plan for next time. Include time in your planning for last minute changes or tweaks to exhibit structures- they always happen! Work traveling can be stressful and exhibit installs don’t make it easier. Fortunately, there may be downtime for you to explore your destination. Take in local fare such as food, shows, or sights. Experiences out of your comfort zone can be rewarding and a great break from other stress. Above all, be sure to keep yourself hydrated and rested as you venture upon something new. Keeping to the plan and simplifying operations will ensure a smoother install and a darker head of hair while allowing your team to fly back with a sense of success.